Welcome to Racers Under the Son Motorcycle Club. Founded by Mike Tarter in February of 1984, RUTS is a non-denominational group of Christian off-road enthusiasts. Our purpose is to be an evangelistic outreach to those who need Jesus Christ as Lord and Savior. We also strive to bring revival to those who are saved. Racers Under The Son is not just another club; we love the Lord and enjoy fellowship with other Christians. God has given each of us special interests, ours just happen to include engines. We take our faith seriously and we strive to be a good witness for Christ in all we do. Are you affiliated with any specific church? We are all just Christian believers who like dirt bikes. A few of our members go to the same church. Most members live too far apart to be in the same church. Our underlying commonality is Jesus Christ and his shed blood for our sins. Second to our love for Christ is our love of dirt bikes and riding/racing. Do all your members race? No. About 30% race and the rest just ride for fun. We are located in Southern California. We don’t have an office, but we do have a P.O. Box. We meet at Fuddruckers at 7802 Orangethorpe, Buena Park (corner of Orangethorpe and Beach, just north of the 91 Fwy). We take care of club business, including planning our club rides and race support. We have a Bible study and end the meeting with group prayer . We also have RUTS members who have moved and started other RUTS chapters in Arizona, Reno, Central California, Northern California and Oregon. What types of racing do you do? We race Desert, Grand Prix, Enduro and Motocross. Most racers in our club prefer to race the “Desert Races” with a some of them also particpating in Enduros, Motocross and GP’s. 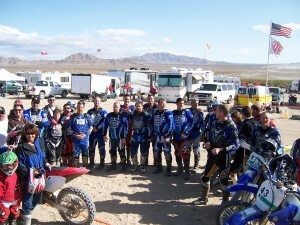 Every June we put on a 2 day event, a Dual European Hare Scramble desert race. This is 1 type of Desert Race. The other “types” are called Hare and Hound and Desert Scrambles. How many members are in RUTS? There are about 100 active families. We usually have about 50-100 people show up at our monthly club rides. At the races we usually have about 15 racers plus a pit crew. How often so you have special events? Once a month we have a “Club Ride”. This might be a match-time Enduro in the desert, or a long trail ride in the mountains. For two-day events we have a bible study around the campfire, potluck desserts and groups rides for kids and even Rhinos! These are the family ride / camp weekends that draw lots of RUTSters! We participate in District 37 AMA sanctioned desert races throughout the year. These are the races we attend. There are about 20 each year that you can find RUTS members participating in. We have a summer BBQ and a December Christmas party. We have meetings once a month for the members and once every other month for the club officers. How did RUTS get started? If your looking for some racing friends, racing support, new riding buddies, or Christian families to camp and ride with, then you are at the right place. Check out our membership page and join the RUTS family. If your ready to join RUTS and have questions, contact us!